Fine, I guess our cavemen ancestors didn’t have search engines to help them find the closest woolly mammoth watering hole or the finest maker of custom wooden clubs this side of Bedrock. 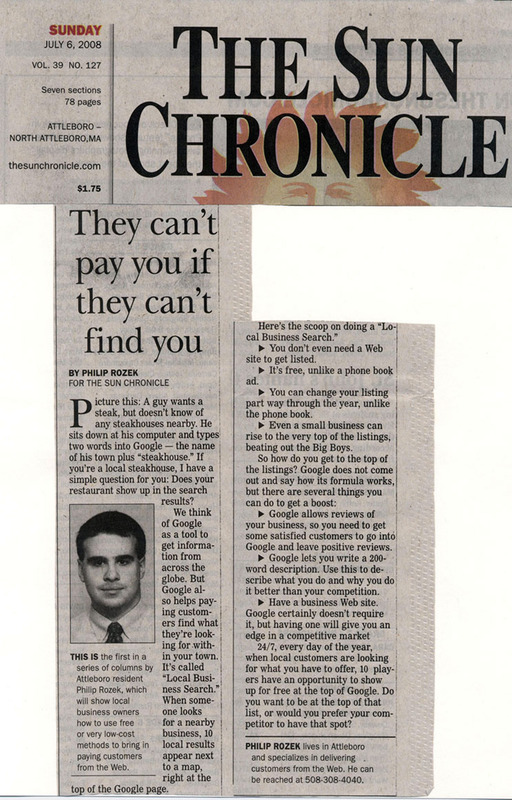 As you can see, I wrote that for my local paper in 2008 – which is like the Triassic period in the fast-evolving world of Google and the Web in general. It’s known as Google Places and not as the Google Local Business Center. 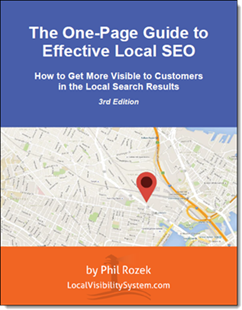 There were probably one-fifth as many people offering local-search optimization/marketing services as there are now. No longer is there space for 10 local businesses on page 1: that number has shrunken to 7 (sometimes fewer). At that point I hadn’t worked with a single client on local Google (I’d only provided web design and Google AdWords management and other good stuff). All I knew about local Google had come from hours and hours of studying local businesses and their rankings. I hadn’t even built my website. The newspaper sure as heck had no reason to give me more than 400 words to write something about that “local internet thing” (as the editor referred to it). But I digress. Once I remembered and dug up my first piece on local search the other day, the first thing that jumped out at me was that the suggestions still hold water. It’s still the case that you’re more likely to rank well locally in Google if you have a website than if you don’t have one. It’s still best to make use of the 200-character “business description” on your Places page, and to you ask your customers for reviews. Of course, that’s old news to you: You already know those things help your local visibility in Google Places. But that’s exactly my point. The fundamentals haven’t changed. True: the people at Mountain View have an insatiable itch to twist the knobs and press the buttons seemingly every other day – causing Google Places to change and your local rankings to bob up and down along with it. Still, your tasks are basically the same: make your Places page as relevant and beefy as possible, do the same for your website, get customer reviews, and pay attention to your citations (this is the one main factor I didn’t really know about 4 years ago). If my old article can tell you anything you didn’t know already, it’s that any time and effort you spend on these core ranking factors is well-spent. Excellent article Phil! You’re so right that the fundamentals haven’t changed. It’s too bad there are so many local businesses that still don’t get the fundamentals. It’s our job to educate. Your posts are always great- keep them coming! Thanks for the compliments, Susan! Couldn’t agree more about how it’s important to “educate.” It’s tough, because the fundamentals aren’t fun: ensuring data-consistency and getting reviews is a pain. They’re also not instantly rewarding (as we both know), so it’s tempting and much easier for business owners to get their time eaten up by fads like Pinterest. Keep up your good “educating” work; I’ll try to keep at it as well!